ROGERS PARK — A man who broke up a fight between three men at a Rogers Park bar may have suffered brain damage after two of the men waited for him outside and viciously beat him with a baseball bat, police and the man's friends said. 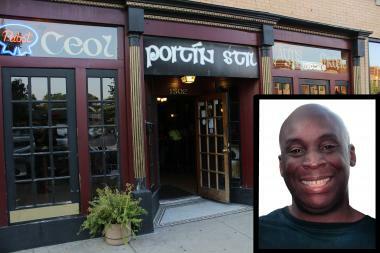 The two men also slashed Michael Davis' face with a knife in the attack early Monday morning outside Poitin Stil, a small neighborhood bar at 1502 W. Jarvis Ave., across the street from Ald. Joe Moore's 49th Ward office. "He took a very serious blow to the head," said Alicia Webb, a niece of Davis. "It’s awful — they waited for him." She said Davis' teeth were knocked out and doctors had to insert a feeding tube. His face will need reconstructive surgery. Since her uncle was admitted to St. Francis Hospital in Evanston the right side of his body hasn't moved, she said. Family and friends have flooded Davis' hospital room to pray for a speedy recovery — so much so the hospital has had to limit visits, family said. Webb said she'd been meeting with Davis' friends to piece together what might have led to the attack on a man who friends call "nonconfrontational" and "loyal." About an hour before police found Davis beaten in the 1400 block of West Jarvis Avenue early Monday, friends said he had broken up a fight between one of the suspected attackers and another bar patron. Several witnesses recounted the series of events they say led to the attack. About 11 p.m. Sunday, two Poitin Stil regulars were playing pool, witnesses said, when the suspected attackers walked into the neighborhood bar. The men began to quarrel with the regulars about whose turn it was to rack the table. When the bartender eventually asked the pair to leave, witnesses said the two men claimed they were being kicked out "because we're black." Another patron in the bar, witnesses said, then replied, "Why do we have to make it about race?" One of the suspects then pushed the patron from his bar stool and onto the floor, which led Davis to step between them and force the two attackers out onto the sidewalk, witnesses said. "When they spilled outside, that’s when I got in between them," said Josh Jacobson, who was playing bag toss at the time. The attackers accused Davis, who is black, of standing up for the "white man" and that he was an "Uncle Tom," witnesses said. While standing between the suspects and Davis, Jacobson said he told the two men to go home and that "this is not how we solve things." "As far as I know, that was the end of it," the 32-year-old Jacobson said. "Apparently they waited for Mike until after the bar closed — when he was walking home they beat him damn near to death with a baseball bat." Davis was found about midnight in the 1400 block of West Jarvis Avenue after multiple witnesses called police. The witnesses said they saw two attackers arguing with Davis before they "began to strike the victim on the head with a baseball bat," said Officer Daniel O'Brien, a police spokesman. He said detectives were investigating. O'Brien said witnesses described the attackers as two black men with dreadlocks, one wearing a pink jersey over a white T-shirt, with blue jeans, and the other wearing a white T-shirt and blue jeans. Jacobson and other friends, a tight-knit group who hang around Poitin Stil and the nearby Lighthouse Tavern, said they couldn't believe something like this would happen to Davis. "We would go to shows together. He's very kind-hearted," said Bill Lowman, a regular bartender at the tavern at 7301 N. Sheridan Road, who has spent mornings before his shifts at Davis' hospital bedside. "He's a very loyal friend. I felt like I needed to be there for him." Lowman said he found out about what happened when detectives visited the bar Monday with a photo of Davis. Linda Webb, Davis' sister, said doctors were waiting to find out about whether her brother will have permanent brain damage, but they predict he'll need long-term care. "He was so passive and just a sweetheart," said Teresa Wheeler, another Poitin Stil regular. "This can't happen anymore. People need to stand up and take back their neighborhood." "We want justice and we want his healing," said Yvette Renee, Davis' longtime friend. "He’s got a long road ahead of him. We’re just hoping and praying for the best."